Today I have a little freebie for the end of the year. 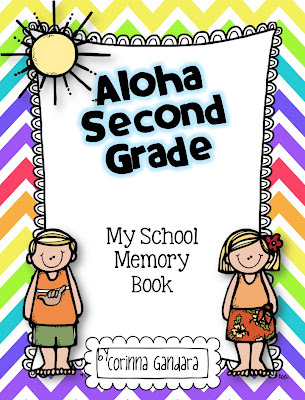 I plan to say Aloha to my students by working on our memory books the last week of school. I have taken lots of pictures and have some items saved up from the year. Just click on the picture to grab this in my TpT store. Have a fabulous week and please know that I appreciate each and every one of you. I thank you for stopping by my blog and leaving me such wonderful comments and feedback! Corinna, I appreciate you ! I have learned so much from you and you share your expertise and fun loving approach so generously :) So glad to know you and share some aloha !! Cute, cute, cute! Thanks a bunch. Love it! Thanks for including pages for first grade!